The blazing June sun beats down on the JROTC Cadets and Instructors at Camp Dawson, West Virginia. 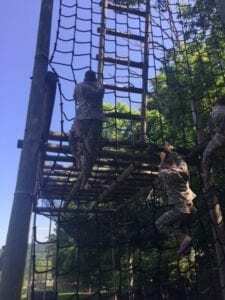 The young high school cadets work their way in teams of ten through the Leadership Reaction Course: obstacles designed to test team work, strength, endurance and problem solving skills. I am in charge of the tank obstacle, an inverted V shaped ramp over 10 feet in height. Ten cadets work as a team to climb over the ramp and maneuver a large, heavy barrel-shaped-drum to the other side. In the mission brief to the cadets, I explain that the drum contains “simulated” electronic devices. These devices will be used to call in an artillery strike on a strategic enemy crossroads and thereby interdict the enemy supply line. If they fail to traverse the obstacle with all cadets or drop the drum, they fail the mission. I give the squad leader 3 minutes to discuss the tactical challenge with his squad and devise a solution. I give the go sign and the cadets attack the obstacle. The cadets form a human pyramid at the base of the obstacle. There, they boost the lighter team members to the top where they discover a rope. They quickly secure the rope and then tie it around the barrel-shaped-drum. They also work as a team to hoist it up and over the tank trap where they gently lower it safely to the far side of the obstacle. 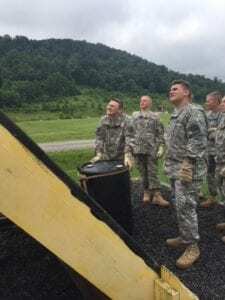 After that comes the challenge of getting all the cadets up and over the tank trap. There are usually a couple of cadets in each team that struggle with under-developed strength, stamina and athletic ability. Some of the stronger team members work together to help their fellow cadets traverse the obstacle. All safely to the other side, I call “endex” on the mission, gather the young men and woman in the shade, have them ground their gear and make sure they hydrate to avoid heat exhaustion. Next comes the After Action Review (AAR). The Cadet Squad Leader and his team discuss what they learned during the mission about team work, overcoming challenges, what worked and what needs to be improved as they move to the next obstacle. Then I give them a moments rest before they rotate to the next challenge, because the strain of mental and physical fatigue is apparent in the faces of the cadets. In the running silence, one of the cadets notices the cross on my Army Camouflage Uniform (ACU) and asks, “sir, why is there a cross on your uniform.” I explain to the cadets that I served Soldiers and their families for twenty-eight years as an Army Chaplain. The cadets wanted to know about the role and responsibilities of an Army Chaplain. I explained as sufficiently as possible, “a chaplain trains and goes where the Soldier goes to provide religious support, counseling and comfort.” One of the kids says, “you are like a pastor that goes with people to where they work and then you work right alongside of them.” I reply, “you nailed it.” And so for the fourth time that day, one of the cadets expresses a desire to serve as a military chaplain because the idea of adventure and service to Soldiers resonates with their personal faith and calling. “I am an Army Junior ROTC Cadet. I will always conduct myself to bring credit to my family, country, school and the Corps of Cadets. I am loyal and patriotic. I am the future of the United States of America. I do not lie, cheat or steal and will always be accountable for my actions and deeds. I will always practice good citizenship and patriotism. I will work hard to improve my mind and strengthen my body. I will seek the mantle of leadership and stand prepared to uphold the Constitution and the American way of life. May God grant me the strength to always live by this creed”. Following the Cadet Creed and while the cadets remain at the position of attention, I take roll. The cadets sound off as I call their name with a loud, “here sir”. Roll taken, the cadets are given the order to “stand – at ease”. I quickly review information for the week’s key events: upcoming practices, competitions, fund raiders, service learning projects, inspections, and key dates for community support by the Color Guard. On the command “fall-out” the cadets break formation and take their seats. The key learning objectives for that day’s lesson plan is on the “whiteboard”. Mondays and Tuesday focus on traditional classroom teaching and interaction. Wednesdays is open ranks uniform inspection. Thursdays is physical training and Fridays is cadet led drill and ceremony. On average I spend an hour a day with my cadets, five days a week, building a supportive relationship and striving to teach by word and deed. Cadet Command provides the JROTC Instructor a laptop computer loaded with a comprehensive Program of Instruction (POI) entitled Curriculum Manager. Lessons are designed to teach core values that lead to success in life and instill traits of leadership and citizenship. 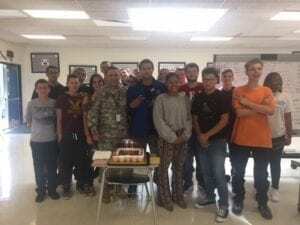 Provided are lesson plans that focus on Army values, personal values, the Constitution, the Bill of Rights, history, decision making, and emotional intelligence, just to name a few. Matters of “ultimate meaning” are in discussion as long as the teaching environment is respectful of different opinions, perspectives and faith traditions. Yes, it is a mental, physical, emotional and spiritual grind: the challenge and calling to coach, teach and mentor the next generation of leaders. But there is unlimited opportunity to make a difference in the life of a young man or woman. Many of them are trying to find their way in a fallen world without healthy adult role models. Into this fulcrum of human need, the JROTC Instructor is invited to bring light into darkness. Just as the Army Chaplain trains, works and deploys with the Soldiers they serve, the JROTC Instructor walks alongside the cadets they serve.